The Douthwrights, are a popular Bluegrass Band from Moncton, New Brunswick.The band consists of, Shane Douthwright, Dennis Douthwright, Nadine Douthwright and Andrew Conde. The band entered the music scene in 1991 when Dennis created Demoiselle Creek Bluegrass Band. Shane joined his father's band in 1993 and ever since, this father and son duo has been entertaining across Canada. Through the years, The Douthwrights have employed their musical skills to entertain fans at the largest festivals in Eastern, Western and Central Canada. They had the honor of opening for country stars Lorie Morgan and Sammy Kershaw. 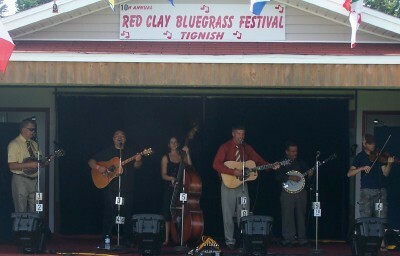 Their 2003 release entitled, The Douthwrights received an ECMA nomination for best bluegrass album of the year. Nadine fills the very important role of keeping the band on time on and off the stage. The Douthwrights are a family oriented band with a hard driving, soulful, and typically comical stage show. Shane and his father have been playing bluegrass together for many years and they are very excited about the future they will share with Shane's wife Nadine on the upright bass and their hot pickin' banjo player Andrew Conde. Shane is considered a gifted singer and guitar player, He has played guitar for 20 years.He won the 2003 & 2004 male vocalist of the year from the Eastern Canadian Bluegrass Awards. He was also nominated in 2004 for guitar player of the year. Shane's father, Dennis is an accomplished mandolin player as well plays fiddle, guitar, lead and baritone vocals. Nadine, band member, joined the group in 2004 and plays bass and harmony vocals. Andrew Conde, newest member of the band in 2005, plays banjo. The band have many gig performances for the balance of 2007. They recently performed at a Bluegrass festival in PEI and had the crowd at the edge of their seats. For information and bookings, contact: Shane Douthwright, 21 Rogers Rd., Berry Mills, N.B., E1G 2N2 or at the above posted addresses.